I cannot tell you how many times that I have gone back and forth on the layout and placement of the cabinets. It’s really been the ultimate challenge for me. I have to design this space using every square inch possible because I desperately need to create storage anywhere I can get it. Equally important is that I dream of a beautiful and clutter free space to spread out and create and work. It’s not a large space but it’s just enough room that if I really think everything through, it could feel huge. I am debating about adding some sort of super thin shelving around the window frame (on both sides) or leaving it alone and have a little hint of wall. I have enough space to add shelving that could be about 2 inches in depth because the side of the shelves and the window frame are about 2 inches. I could do a lot with 2 inch shelves but I also like the idea of being able to hang some smaller prints on the wall. What do you think? I could see stacking my hundreds of little jars of enamel paints on the narrow shelving but I also would love to hang some prints. Function or beauty? The space is finally coming together almost exactly as I envisioned and it’s so exciting to think that my daughter and I are less than a week away from having such a great dream space to work and create in. So that’s my update so far. I would love to know what you guys think about the narrow shelving around the window. I think my brain has tired of over thinking all of this! By the way, if you missed last week’s post about the vinyl plank floors from BuildDirect, you can get to that post here. « Young House Love Paint Color Picks (Color Palette Monday).. Thanks Megan! I think I can see the light at the end of the tunnel! I can already tell this is going to be a fantastic space. Can’t wait to see it all finished. 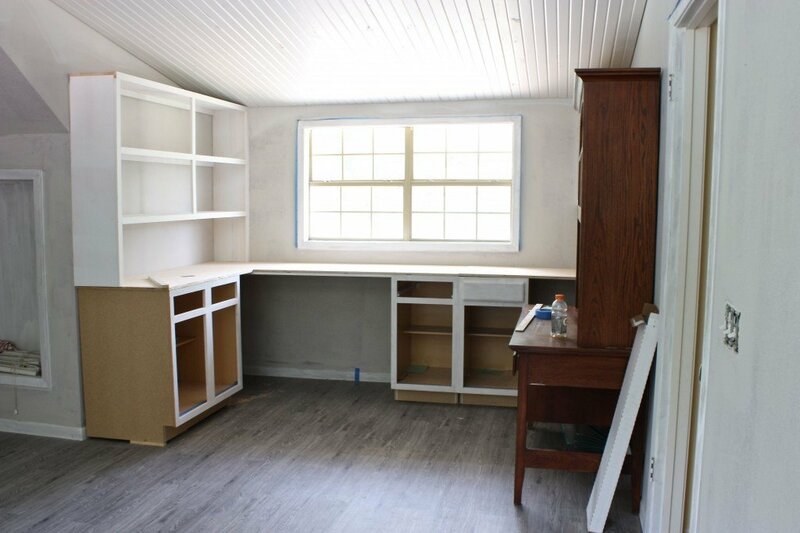 This space is fantastic and I’m green with envy as I’m beginning to design my first craft room ever! As for your narrow space? I say put narrow shelves in! You could fit prints into your shelving or on an easel. That’s a great idea Camille! Best of both worlds! Hmmm… Thanks so much! I love it already! Lots of light, drawers and good space. Looking forward to seeing the progress and what colors your choose. Whatever you decide it will be fantastic. I say go for the little shelves. You know you will use them! If you have to look at something pretty or inspiring to you, maybe you can hang a print on that little door? Cyndy you are going to love all the cabinetry, looks very nice. I think with all the shelving installed now, the little door will almost disappear. You will be so organized now, with all your craft projects. Looking good, Katherine in Portland. Thanks Katherine! I almost cried when all the cabinets went in, LOL! It will be so nice to have everything in place and not tucked away in spots throughout our home. What about shelves just part-way up, so you have room for some prints above them? Thanks Jenny! It really is finally starting to take form. I hope that all the colors and fabrics come together as planned in my brain! LOL! I keep thinking that I need a couple spots for some inspiring art work. Thanks for stopping by and following along! Big hugs! Beautiful! So bright and airy! I say leave the wall area open for your prints. You could switch them out if you like. It’s always good to have some open space, and by not putting the shelves around it, the window will look even larger. Either way-ENJOY! Oh, the dilemma. Space for prints sounded nice but displaying your paints is a good use of space and may even look very nice on glass shelves. Something else that came to mind was corkboard. 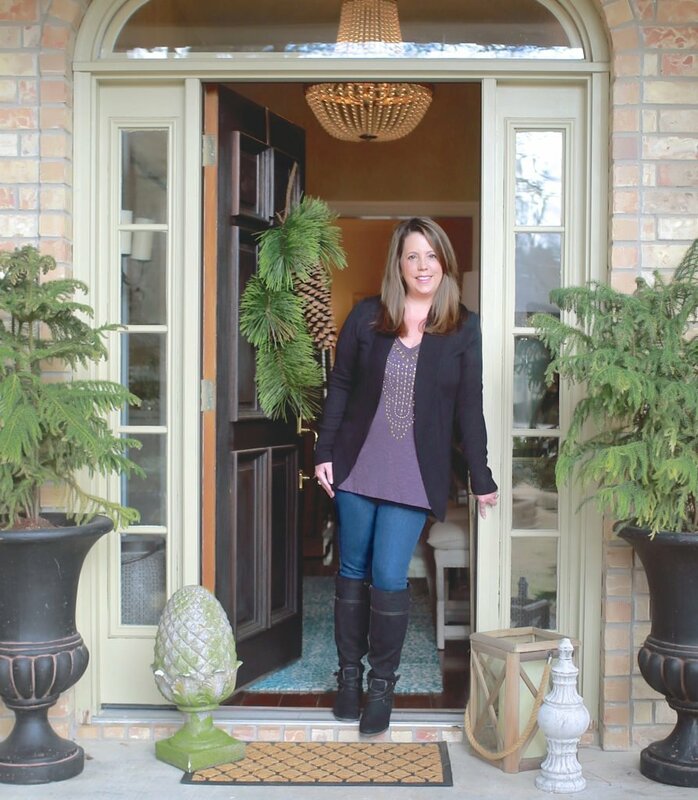 I can envision your planning boards and fabric samples displayed at eye level. I know whatever you decide to do will be fabulous! So envious! I’d go with the little shelves around the window. I’m having the same problem in my art room now….where do I put those little bottles/jars. Artists always need storage. We can hang our artwork anywhere. Your space is looking lovely already, can’t wait for the finished product! As for my two cents on the arrow shelving, I say go for it. I don’t think you will regret having extra storage or display space. I would put paints out because I like having them at hand and enjoy seeing all the color they add to a room, if you don’t like that, you could either do just prints, or mix it up a bit! Ahhhh such a lovely room! Lucky you. As for the shelving vs prints…I say put a small shelve up top on both sides for those adorable paints and below put a cute print on one side and a cute burlap, nailhead cork board, and use great paper to put goals/visions/important dates! But as everyone else has said…what ever you do, I’m SURE it will be fantastic! All the best and can not wait to see the big reveal! It is really looking good. I think adding the shelving around the windows would look great. Cyndy this is just coming together so beautifully!! Those floors!! Seriously can not get enough of them! I vote for going without the shelves around the window. 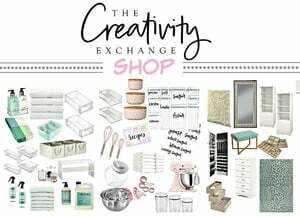 Reason: when you have a lot of things going on in a room (shelves, boxes, containers, etc.) the eye needs some neutral space to ‘rest’ in order to keep the feel of space and airiness. I agree with Amanda, June 13, ‘Function and Beauty together’. And, as you know, I always want both! It’s looking great!! Proud of you and envious! I would leave the narrow wall space for art work. 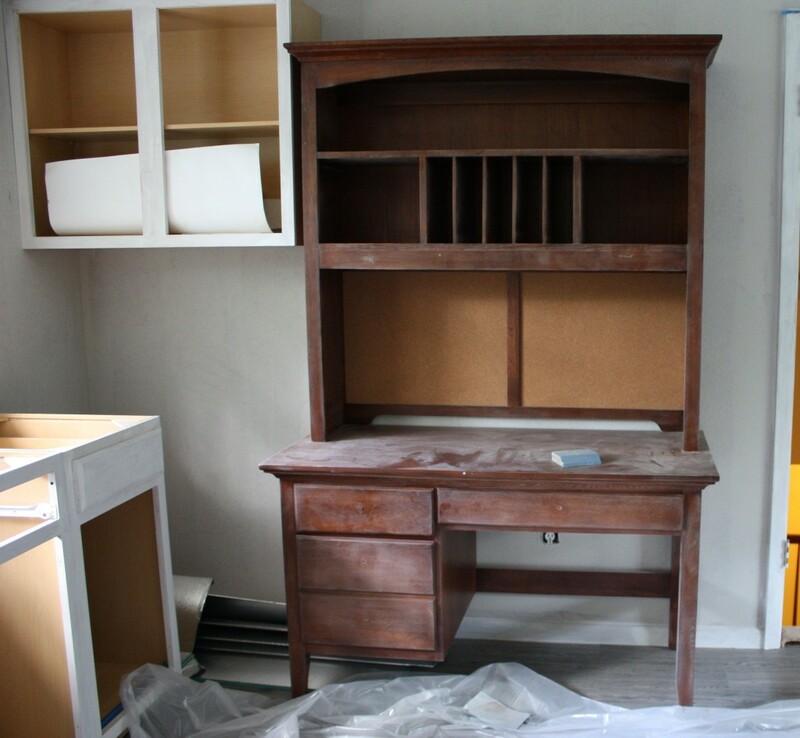 My question – is the desk a done deal? You could add much more storage space there (and the area to the left of the desk). You would also have a more coherent space. The table will give you sufficient writing/crafting space. I agree with Wendy to leave the space open for the eye to ‘rest’. See how it looks and works for you for a while. You can always add little shelves but I think it will look nicer with some space around the window. Also, as Linda mentioned, if you continued with the cabinet and shelves all the way around (instead of the desk), it would probably serve you better. 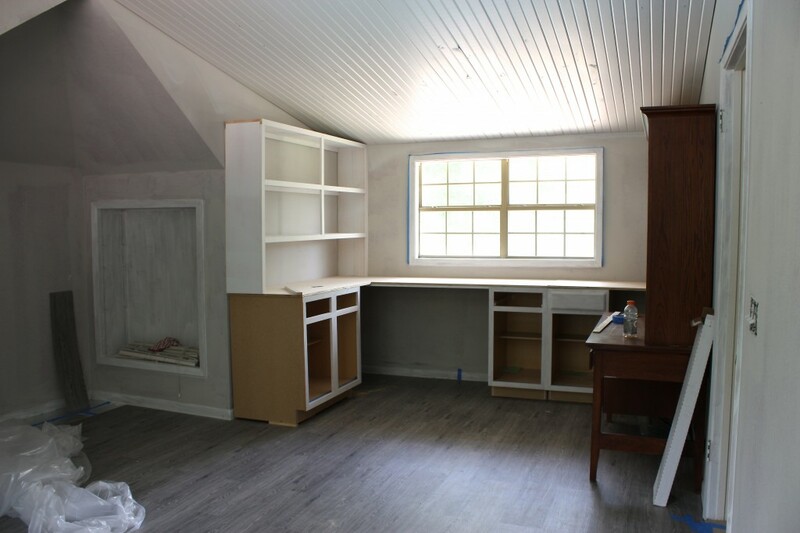 I think the desk, even though you are going to paint it, looks inconsistent with the rest of the layout, especially because it’s flat surface is a different height from the other cabinetry. Have you figured out how you’re going to utilize the corners? I can see putting a wastebasket in the left corner next to where you will be working (in front of the window). The right corner is kind of a large space that may be awkward to use. That might need some creative thinking. If it was me, I think I would take the single right hand cabinet off the wall and put it on the floor, maybe with another cabinet just the same, or one half it’s size with a single opening. 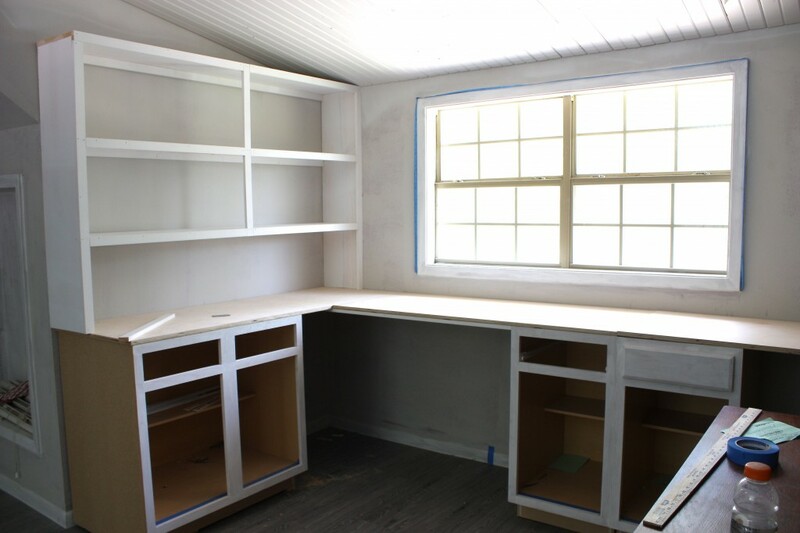 (I’m assuming these cabinets will have doors, but the shelves will be open.) Then I would build shelves all along that wall the same as on the other wall. However, you mentioned your daughter and if she also needs a work space, you would need to see if you can build that in with the cabinetry. 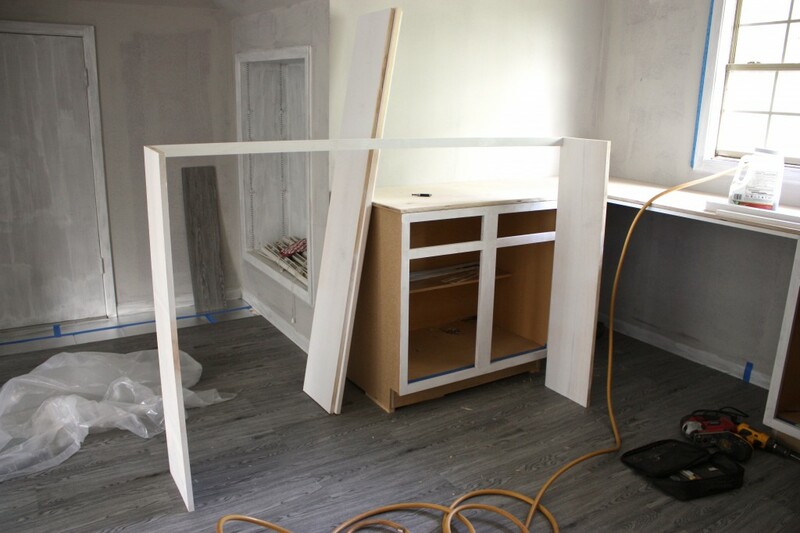 I can’t tell without measurements but it looks like the double door cabinet would just fit and a counter top with open space underneath could continue to the door for the second work area. I love your room, The white ceiling is perfect for getting more light into the room. A beautiful creation. I also like the idea of half shelves and have blank wall around the windows. Oh! What would I not give for such a wonderful space!!!! I am loving all the updates on the office space…thanks so much for keeping us posted. Can’t wait to see the finished space. This is fabulous! You did a great job building it and have inspired me to do something similar in my home. Thanks! !